This hole, it was made for me! "If you're like me, when you first saw this question, you might've imagined the puck leaving a cartoon-style hockey-puck-shaped hole. But that's because our intuitions are shaky about how materials react at very high speeds." Any cartoon character running towards a solid body at sufficient speed will pass through and leave a hole exactly the same shape as they are (including clothing, fur and whiskers, etc.). May be combined with There Was a Door and be played for comedy. If the character is large enough, it can become a Roofless Renovation. Can also be horizontal if falling from a great height. Sometimes, if the surface is metal, the character will leave a perfect depressive imprint, often in impossible mold-like shapes. For dramatic use see Crater Power. Happy Heroes: In Season 5 episode 1, Big M. and Little M. sneak into Doctor H.'s bedroom, where they accidentally set off a bomb and are sent flying through the bedroom wall. The resulting holes in the wall are shaped just like them. Motu Patlu: In "Time Machine", Motu and Patlu create holes that are shaped like them when they run through giant leaves. In Pleasant Goat and Big Big Wolf, any character who busts through the gate to Goat Village leaves a silhouette of themselves in the gate. When John Pinette was seated in an exit row on a plane, the flight attendant lectured him about his responsibility to open the door if there was an emergency. John responded that he would not open the door, he'd make his own door, and everyone would want to use his door because it would be much bigger than the other one. When their boss wants to assign a dangerous mission to the eponymous protagonists of Mortadelo y Filemón, he usually finds only their silhouettes in a nearby wall (or in one case a several-inches-thick solid steel armor plate). Done a number of times in Don Rosa's Uncle Scrooge stories "The Black Knight" and "The Black Knight Glorps Again", thanks to Arpin Lusene's suit of universal-solvent-coated armor. At one point Donald is blasted through a wall in a similar way by a sabotaged canon, and Lusène notes that this trick is much easier with his suit. In Action Comics issue #308, Supergirl takes care of a little girl who has gained powers for a short while. At a point, the child -Candy- trips over a toy and plunges through the wall of the house, leaving a Candy-shaped hole. In a rare reverse example, Underground Comics superhero Wonder Wart-Hog repels an alien bombing of Earth, then catches a tiny Happy Fun Ball bomb, which explodes and evaporates the city, leaving a Grand Canyon-size crater, with only remaining sections of the building and street that were shielded by his invulnerable body. In one arc after Garfield's birthday, Garfield does it to Nermal three times, leaving three perfectly Nermal-shaped holes in the wall. Happens again (just one hole though) in the May 31, 2008 strip , prompting Jon to say he's getting tired of replacing their front door. The June 9th, 2011 strip had Garfield sending Nermal through a door, which left a Nermal-shaped hole in the door. Downplayed in Calvin and Hobbes: The Series: Socrates ends up crashing into the ceiling, but never actually breaks through it. In episode 36 of Dragon Ball Z Abridged, during Vegeta's initial attack on Android 19, he kicks the robot so hard, the android's body extends in a foot-shaped lump behind him. Vegeta: Well well, looks like I'm a size 19. In chapter 12 of Star Trek Odyssey URE , Ron is teaching an extreme combat course at Beacon Academy, and has managed to absolutely mop the floor with teams RWBY and CFYV. To knock Ron's ego down a few pegs, Jaden gave team RWBY some enhanced dust rounds that were more powerful and had tracking capabilities. The shot that Ruby hit Ron with sent him flying into the opposite wall and left behind a "perfectly Ron-shapped crater." Check out minute 2:12 of Ray Steven's "Sitting Up with the Dead" video. I hollered, "Rev, that kitchen ain't got no door in it!" He said, "Don't worry son, it will have in a minute!" In Michael Jackson's "Smooth Criminal" (Moonwalker version), Michael shoots a gangster and blows him across the room and through a brick wall, leaving a man-shaped hole. 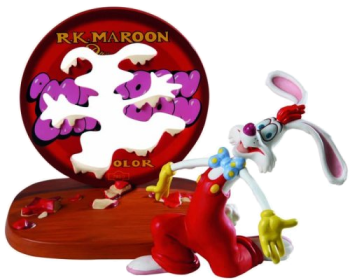 The bottom of the playfield for Data East's Batman pinball shows the Joker's body making a silhouette on the ground after his fall from the church tower. Referenced in the Edinburgh Fringe 2017 episode of The Now Show, claiming The BBC's Fringe tent may have been reused, as it smells of cake and has a Paul Hollywood-shaped hole. One of the sample powers in the HERO system sourcebook, designed for super-strong characters, is essentially the ability to do this by smashing into the wall and crashing through. It's based off of the tunnelling power intended to let you dig through soil at superspeed — except it only works on walls. Paranoia adventure "Vapors Don't Shoot Back". During the adventure the PCs will attack an old ship. One picture shows a clone-shaped hole in the ship after a PC on a jet ski has run through it. 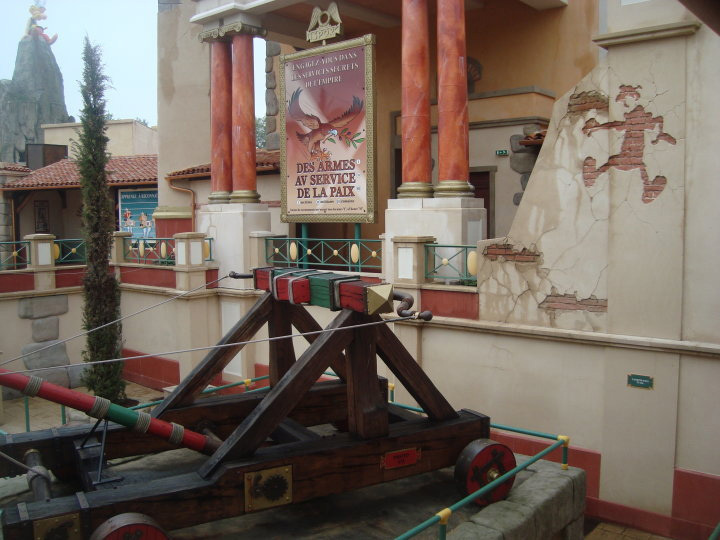 A ballista display ◊ from Parc Asterix alludes of such an incident (with just the outer layer of a wall, though, not going through). You actually go through one ◊ in Goofy's Barnstormer. 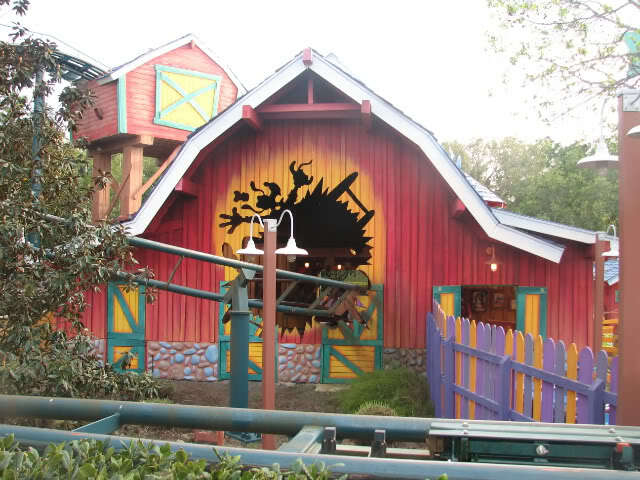 After Snidely gets fired out of a cannon in Dudley Do-Right's Ripsaw Falls, he crashes through a building, leaving behind a silhouette. A Cracked column has noted that the reaction of a Cracked employee to hearing the words "Open Bar" involved leaving a man-shaped hole in the wall. Discussed in What If?, "Hockey Puck ". In the review of Princess Diaries 2, when Hyper Fangirl goes crazy trying to play the movie again, her forgetting to update the DVD player somehow electrocutes her and sends her flying through the roof, leaving a hole in the shape of her body. In "Top 11 Anti-Drug PSAs", during an ad featuring a woman diving into an empty pool, the Critic ponders if this happened while the ad cuts away from the woman. The Sci-Fi analysis website Atomic Rockets states in its Space Warfare section note Ctrl-F "Hypervelocity" and scroll down to the Wil-E Coyote pic that the possibility of this happening in Real Life depends on how fast the impact is compared to the speed of sound in the impacted material. Impact Silhouettes happen at Mach 1 in the target material (5000 feet/second for steel), which given sound travels faster in most solids than in air is very fast indeed. Death Battle: This is the fate of Twilight Sparkle after Raven's soul self divebombs her at Mach 36, leaving nothing but a pony-shaped hole in the ground. This also makes it an Ambiguous Ending on whether she actually died or not. In an example of Reality Is Unrealistic, a common objection by 9/11 conspiracy theorists is the complete and total failure of the 757 which crashed into the Pentagon, to make a 757-shaped "hole" in the reinforced, feet-thick fortress wall, complete with wings. Ironically, if you factor out the wings (which, being lightweight and hollow, simply disintegrated on impact), it actually did leave a 757-shaped hole. It also helps that the plane had hit the ground first and had a reduced speed upon impact. The commonly-cited Popular Mechanics rebuttal of this theory specifically mentions, hilariously, that a jumbo jet does not leave "a cartoonish hole" shaped exactly like an airplane. Not helping the issue was the fact that the entrance holes ◊ in the World Trade Center buildings did look like a plane with wings, unlike the Pentagon's smaller conical hole (this was because the Pentagon's walls are heavily reinforced with numerous interior pillars, unlike the WTC's glass and concrete outer shell). Check out this photo ◊ from The Other Wiki of the USS Hinsdale after taking a hit from a Kamikaze pilot. Trees along the sides of roads will often have their branches "trimmed" into rectangular openings by passing trucks. Not a hole, but the impact of an owl, carrying a mouse, flying into a parked car covered in dew does leave a distinct, recognizable record of the event .